Since the creation of the first hedge fund by sociologist, author, and financial journalist Alfred W. Jones in 1949, diversification in fund strategies and overall industry expansion have made hedge funds as an asset class more heterogeneous than they were before. As of end of calendar year 2011, there were approximately 9,500 individual hedge funds across globe, in the marketplace with more than $2.13 trillion in assets under management. General investing strategies include global macro, event driven, relative value, equity funds, quantitative funds, multi-strategy funds, and managed futures trading. In a more recent experiment, the Markowitz efficient frontier of hedge funds determines the components of the minimum variance portfolio for any given return, and not surprisingly, at least for me, the result shows that multiple strategies make up each efficient portfolio. Emerging markets, equity non-hedge, fund of funds (FOFs), and event driven are not part of any point on the frontier, due to their sub-optimal risk-return profiles. By contrast, the minimum risk portfolio includes strategies of convertible arbitrage, equity market neutral, statistical arbitrage, fixed income (RV), market timing, merger arbitrage, relative value, and short selling. Observing the efficient frontier, more risk-averse investors will diversify mainly between non-directional and event-driven strategies, while more aggressive investors will spread their exposure primarily among directional strategies. *Please keep in mind that a correlation above 0.6 suggests that two asset classes produce returns with a similar pattern over time and do not provide a significant diversification benefit. To control survivorship bias and backfill bias, dead funds must be included and the first 18 months of performance was excluded, which result in total 6,985 distinct hedge funds and funds of funds from the universe. 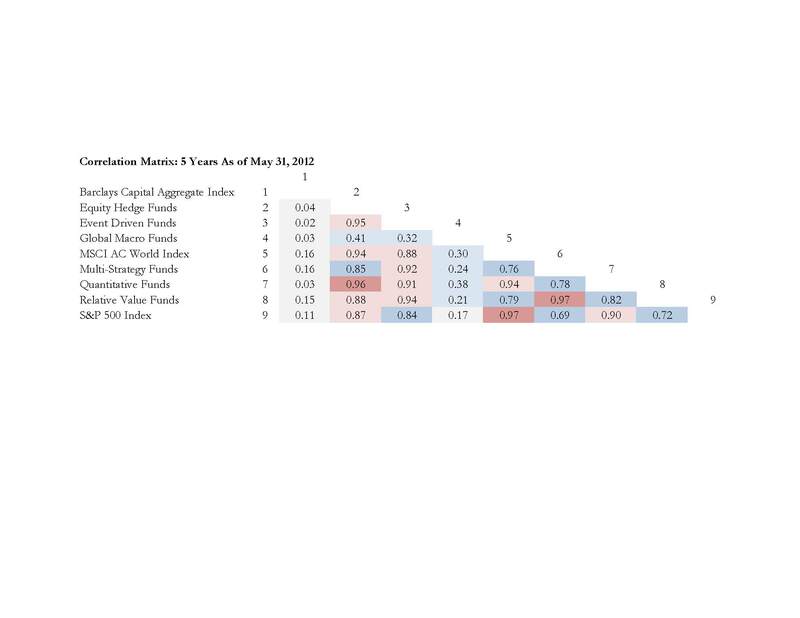 In direct hedge funds, this experiment has found and confirmed significant positive relationships between performance with both sector and asset class diversification, while significant negative relationships with both style and geographic diversification. 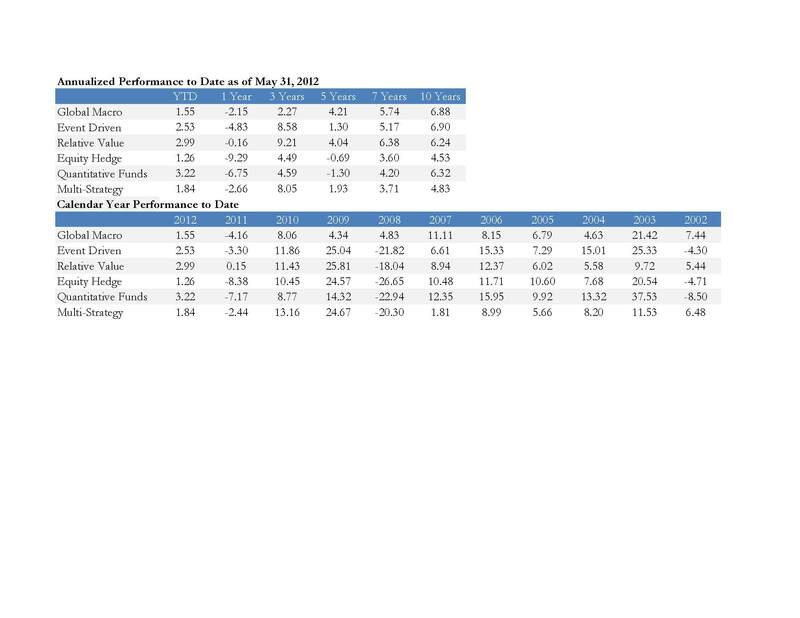 In FOFs, this approach has discovered mixed results: 1) sector diversification positively correlates with returns; 2) geographic diversification negatively correlates with returns across some measures; 3) FOFs performance is negatively associated with asset class diversification. 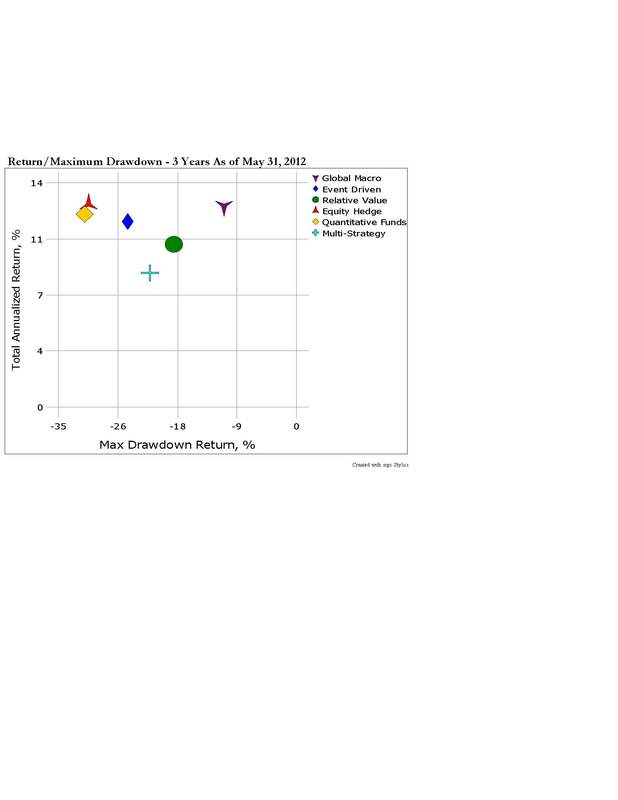 Furthermore, it is interesting to note that FOFs failure rates increase with style diversification. If you are also interested in how diversification relates to incentive structure, a factor model that includes fees and a high-water mark dummy variable is a quick tool. My most recent study shows that higher fees are associated with diversification across all variables except geography, which carries a negative correlation. Monte-Carlo simulation. Creating equally weighted portfolios of increasing size (N=1, 2, …50) by randomly selecting hedge funds, and for each portfolio size, this process is repeated 1,000 times to obtain 1,000 observation of each statistic. What is the optimal number of hedge funds to effectively benefit from diversification? Many institutions are attracted to diversified portfolios of hedge funds, i.e. FOFs. Empirical studies suggest that less than 40 managers is sufficient to beat the benchmark while variance reducing effects of diversification peter out once FOFs hold more than 20 underlying hedge funds. In this sense, by examining FOFs managers across the industry, it is fair to say that the majority of FOFs are over-diversified. Excess diversification results in undesirable side effects in the higher moments of the return distribution. It increases the left tail risk exposure of FOFs especially when the extent to which hedge fund returns are smoothed is counted. Hedge Fund Research (HFR) database shows that average FOF are more exposed to left tail risk, and the increase in tail risk is accompanied by lower returns. 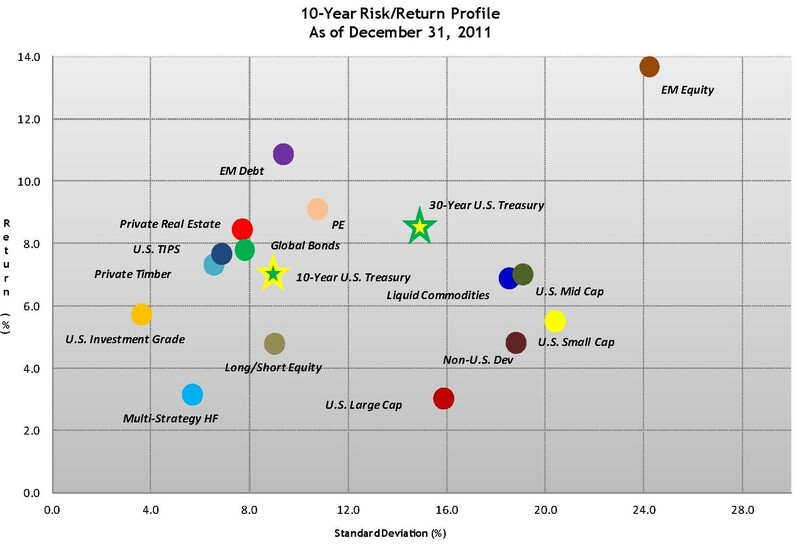 Many hedge fund intermediaries do NOT have an asset allocation strategy? !